Although the right actually bested the left on the first round in overall votes, this will not save Nicolas Sarkozy on the second round. The first round of the French presidential elections may have given the supporters of President Nicolas Sarkozy some hope, but it is a false hope. To the consternation of the pollsters, Marine Le Pen got 18%, which is 3% more than the pollsters gave her credit for, while the Left Front of Jean-Luc Melenchon got 3% less than expected and finished under 12%. This means that on the first-round, votes for the right exceeded those for the left and if the voters retain their ideological allegiance into the second round, Sarkozy has a fighting chance. Le Figaro, one of the few newspapers to support Sarkozy in the contest, appeared with a headline "Le Pen will be the arbiter." This is precisely Sarkozy's problem, because if he were a Roman gladiator, he would see Marine Le Pen holding a big thumbs down. Of course, Madam Le Pen could not be so crude, so she merely remarked that she would not advise her supporters on how to vote on the 2nd round. Melenchon, in contrast, has instructed his supporters to go to the polls enmasse on the 2nd round, not in support of Francois Hollande, but in order to smash the axis between Sarkozy and Angela Merkel. Eva Joly of the Green Party is also bringing her 2 percentage points over to the socialist candidate. Although the polls published after the first round show 60% of National Front voters breaking for Nicolas Sarkozy, that will fall short of the nearly unanimous backing for Francois Hollande by voters who supported other candidates of the left on the first-round. The election is therefore Hollande's to lose and if he plays it conservative and cautious, as he has done up to now, he should have no difficulty in winning the election on May 6. Sarkozy's last hope is to trounce Hollande in the debates between the two - again, a flimsy hope but the outgoing president will go down fighting to the final bell. Following his expected victory, Hollande's first order of business will be winning the legislative elections that follow in June. French voters generally give the party of a newly elected president a majority in the National Assembly to work with. The interesting question will be whether the Marine Le Pen's National Front can finally break through in legislative elections. The single-member district voting system has shut out the National Front in the National Assembly. 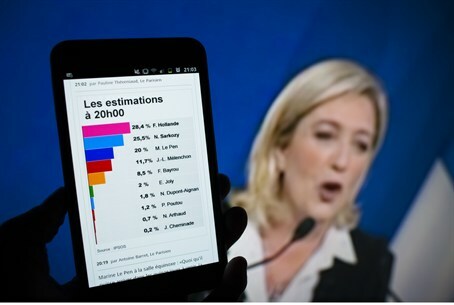 Yesterday, however, Marine Le Pen was scoring over 25% in some areas and that could serve as a springboard for a National Front candidate in the legislative elections.